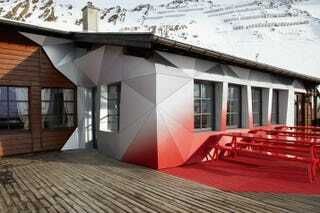 The Obergurgl-Hochgurgl ski area, in the Austrian Alps, is full of lodges just like this: Rustic, charmingly worn, oh-so-cozy, and—wait—colonized by a bizarre parasite that spews red and white triangles across its facade? Not exactly. But as part of a recent promotion, Audi and the ski resort commissioned Designliga, a Munich interior design firm, to transform a rustic ski lodge into a futuristic design object. Because the lodge was base camp for trying out Audi's quattro drive, they requested that the designers use the same techniques and materials that Audi uses in its cars—so the whole space is kitted out with perfectly flush detailing, matte anodized aluminum, and other finishing touches borrowed from automotive design.